News flash: even more recent updates to this information are available to subscribers to the full Technology User Profile service, the TUP Overview Report, and other TUP Profile Reports. Apple has been a persistent genius in leading market perception. Watch a Hollywood movie, and if a computer is being shown, chances are good that Apple’s product placement experts will have made sure the Apple logo or product is prominent. Similarly, Apple has a higher share among computers being used in public places, which might lead a casual café observer to expect Apple is the dominant brand. 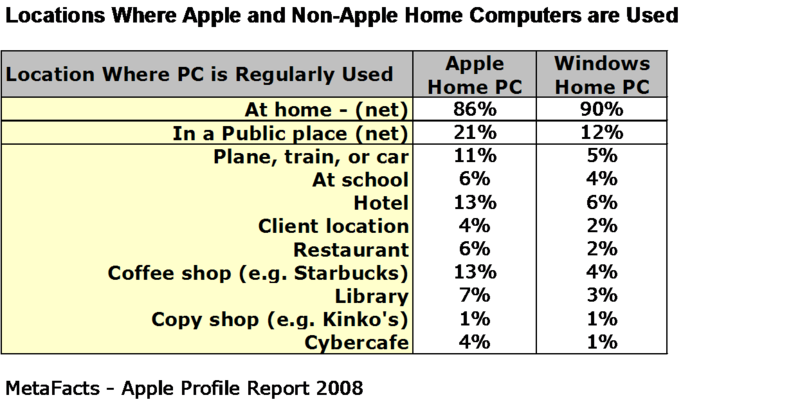 Nearly twice as many Apple Home PCs are used in public places than Windows Home PCs. This is due in part to the larger share of Apple Home PCs that are mobile than Windows PCs. Taking this into account, Apple’s share of public mobile Home PCs is 14%, much higher than Apple’s 8% share of mobile Home PCs. Also, Apple’s notebook users are more mobile than Windows notebook & tablet users, using their mobile computers regularly in 4.0 locations on average, compared with 2.8 locations for Windows mobile PC users. However, just because a higher share of Apple’s computers are used in public places, it doesn’t mean that Apple has the dominant share of public or notebook PCs. In cybercafés and coffee shops, Apple ranks number two with 18% of the installed base of Home PCs being used in these locations.